History: 1994 year opened, the first knitting and woolen series of professional marketScale: more than 300 shopsProducts: knitting and woolen clothingPrice level: midrange and high-gradeTips: it offer shops, offices, renting warehouse, consignment, business center and so on service. 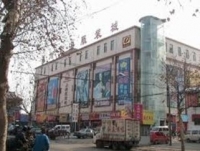 History: good position, advanced equipment and facilities, good business reputation, scientific management, high-quality staff teamScale: more than 2000 k㎡Products: foreign trade wool knittingPrice level: all-gradeTips: there are five floors. The 1st to 4th floors are for wholesale clothing.